The Secrets of Gravitational Waves Could be Deciphered? Almost all galaxies are known to have a single supermassive black hole at their heart. However, an international team of scientists have recently discovered a bizarre galaxy, which has three supermassive black holes in it’s center. The new galaxy may help astronomers to decipher the mystery of gravitational waves, the ‘ripples in spacetime’ predicted by Albert Einstein. The finding, published in the journal Nature, was made by an international team led by Dr Roger Deane from the University of Cape Town. They examined six galactic systems thought to contain two supermassive black holes. Scientists have discovered that one of them, called SDSS J1502 1115, at a distance of 4 billion years light away, have three supermassive black holes. 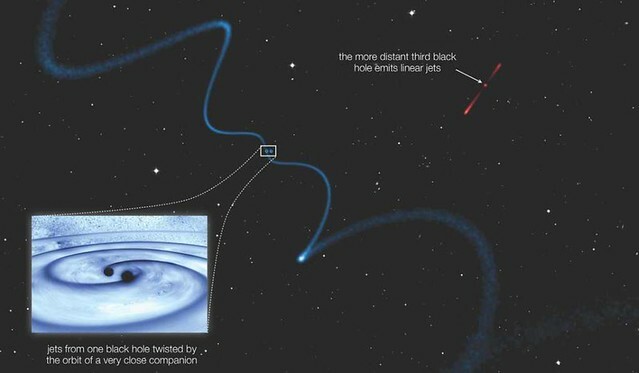 This is the tightest “trio” black holes detected at such a large distance, with two of them orbiting each other at just 500 light years apart rather like binary stars. Astronomers have discovered three closely orbiting supermassive black holes in a galaxy more than 4 billion light years away. 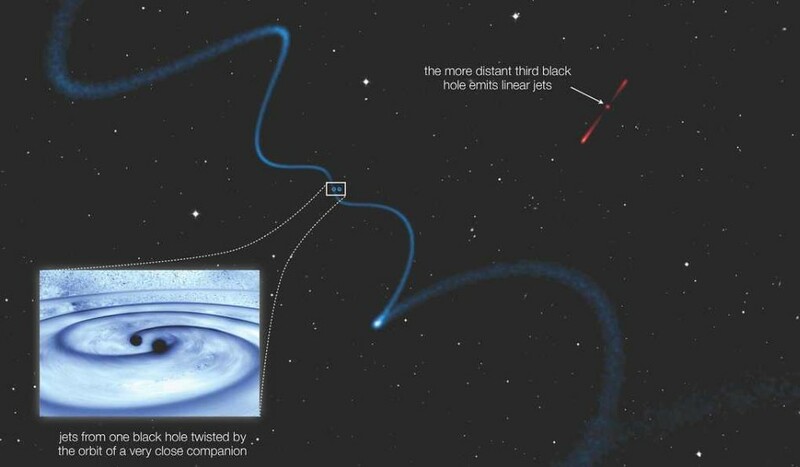 Illustrated here are helix-shaped jets from one supermassive black hole caused by its very closely orbiting companion, while the third black hole emits relatively straight jets due to its distance. Researchers believe that these closely-packed supermassive black holes – each with a mass between 1 million to 10 billion times that of the sun – could be more common in the universe than previously thought. The three supermassive black holes could also provide valuable information about gravitational waves. The discovery was made using a technique called “Very Long Baseline Interferometry” (VLBI). The technique combines the signals captured by several huge radio antennas around the world, separated by up 10,000 km, to see detail 50 times finer than that possible with the Hubble Space Telescope. Radio signals were captured by European VLBI Network, an arry of European, Chinese, Russian and South African antennas. Future radio telescopes, like the Square Kilometre Array (SKA), will be able to achive precise measurements of gravitational waves emitted from such black holes systems. Professor Matt Jarvis of Oxford University’s Department of Physics, an author of the paper, added: ‘General Relativity predicts that merging black holes are sources of gravitational waves and in this work we have managed to spot three black holes packed about as tightly together as they could be before spiralling into each other and merging. Could the accelerating rate of expansion of the cosmos be the result of matter “surfing” on the ubiquitous gravitational waves emanating outward from Big Bang?